Thinking about getting a Savage rifle? With the Save on a Savage Rebate you can save up to $100.00. Here’s how the promo works: Get a Savage Model 12 or 10/110 LE Series rifle and claim a $100 mail-in rebate, or choose any Model 25, Trophy Predator Hunter, or AXIS Heavy Barrel and get $50 back. Rimfire shooters who purchase any Mark ll, Model 93, 93R17 or B.MAG will be eligible for a $25 mail-in rebate. To qualify for the rebate, you must purchase the rifle before May 31, 2015, and submit a rebate form before June 30, 2015. CLICK HERE to Download Savage REBATE Coupon. Firearms must be purchased between February 1, 2015 and May 31, 2015. Rebate coupon must be received by June 30, 2015. Trophy Hunter XP and Trophy Predator Hunter XP models eligible in U.S. only; Int’l Trophy Hunter XP and Int’l Trophy Predator Hunter XP models eligible in Canada only. This rebate of Federal Firearms Excise Tax is paid for the benefit of our vendee as a reduction in their original purchase price of the article. Offer valid in U.S. and Canada; U.S. funds only. Story Tip from EdLongrange. We welcome reader submission. 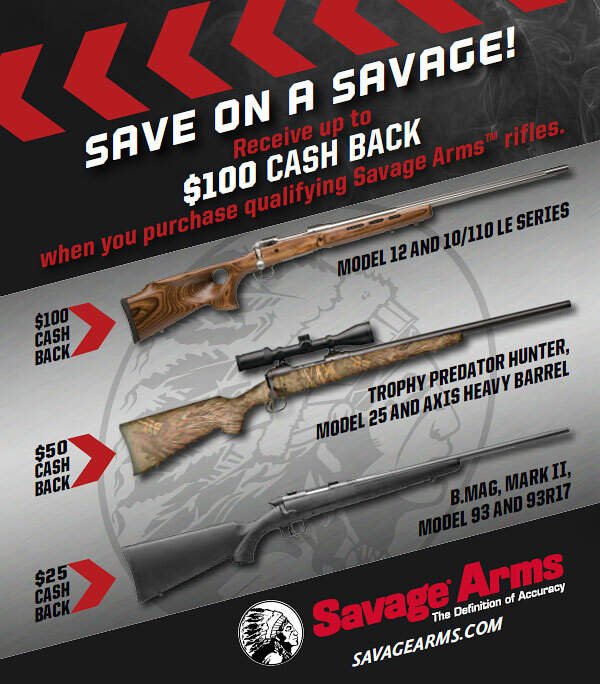 Share the post "Rebates on Savage Rifles — Save Up to $100.00"